Story is the bond of humanity. It is how we process and make meaning of the world around us and how we share with each other. Story can merge across the boundaries of history, art, news, science, experience... Telling the story of a work of art can give deeper meaning and understanding for inspiration and process. An artist statement for an exhibit is a kind of story as well. The story of a place can be infused with history and visual encoding to help us go deeper. In my work, I sometimes use story as an accompaniment for those who are curious to dive in. A collaborative call and response project with San Fransisco writer, Keith Donnell Jr. involved seven digital collages paired with poetry in seven days. Nostalgia, longing, and the passage of time are elements for this reflective story, When I was a child, and the companion encaustic painting, Forgotten Conversations. 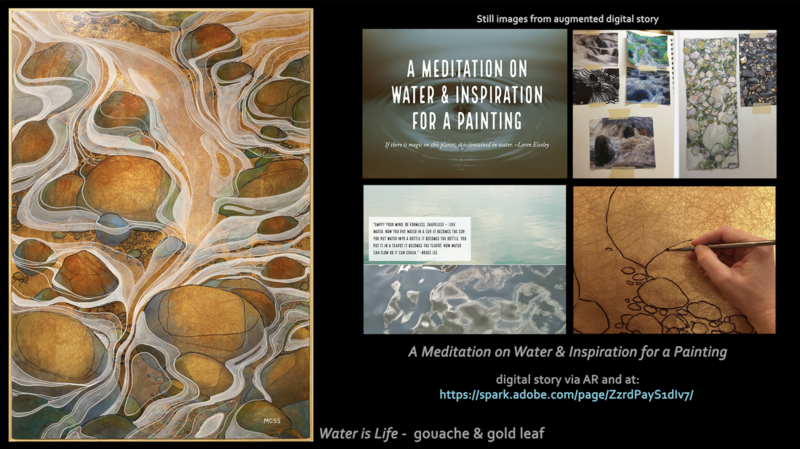 ​This is a personal account of inspiration and process for a gouache & gold leaf painting. The wrap is made of felted wool and silk with elements of steel, flint, and Fomes fomentarius fungus. Read more about inspiration for the wrap piece here. This is an example of an information-driven story of a fungal species in nature and how it is used by humans as a tool. It accompanied a work of art during an exhibition in 2017 to provide background ethnobotany information on materials used in the piece. The artwork and background story were also accompanied by a hands-on display where viewers could interact through touch. You can read more about the project this was part of here: ITOC: Microbial Worlds. An example of meaning making through emergent technology. This was an Augmented Reality exhibition and scavenger hunt created in 2013 for a teaching with technology conference. I was lead designer on this project that crosses boundaries between illustration, art, technology, and history. Through this project, we recreated the story of place and involved participants through the use of scavenger hunt with related quizzes and race for the top prize. Digital stories can take many formats. If you are interested, please see this site I produced as a learning reference through my work at UAF eLearning where you will find links to some amazing examples of Digital Storytelling​​ created by others and tips on getting started.